Specifically, she wanted to find out whether Tapping could be an effective tool to reduce burnout in public school teachers. 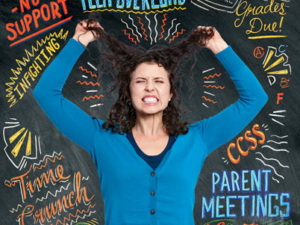 Burnout is a serious and widespread issue in public education, and proposed programs to remedy the issue have been too expensive for most districts to implement. After an exhaustive search, Reynolds discovered EFT. If Tapping were effective in this context, she mused, it could mean an inexpensive and accessible solution to teacher burnout, having a highly positive impact on public education. A veteran teacher herself, Reynolds used the The EFT Manual by EFT’s developer, Gary Craig, to design the instruction component. She then created her study using established tools that measure teacher burnout, which has three components: emotional exhaustion, depersonalization (a feeling of being detached from what’s happening around you), and professional accomplishment. The tool measured numerous aspects of the three components using a scale of 0-6, similar to the scale used in assessing the intensity of symptom or emotional changes in Tapping. The researcher worked with 126 full-time public school teachers in Illinois over a 4-week period. She wanted to make sure the control and the test groups did not mix, so she chose teachers from six different districts with similar demographics. 76 teachers from the test group and 47 from the control group completed the entire protocol. Both groups were provided with the exact same protocol with one exception: the control group was taught a “sham” method of Tapping that didn’t engage the proper acupressure points. All participants agreed to tap every day for four weeks and then fill out another assessment form. They were also instructed to write in a journal about their experiences with Tapping, noting if they felt any changes throughout the study. The test group participants (using the proper acupressure points) experienced a significant reduction in burnout in all three areas, emotional exhaustion, depersonalization, and professional accomplishment.